No more excuses. No high-wet grass to discourage kids from running out on the soccer field. No prohibitive costs limiting families from getting involved. No misconceptions that soccer is only for the elite. Oregon Futbol Academy, located in Grants Pass, now has an indoor facility making year-round soccer accessible and open to all. Futsal is a five-player-a-side indoor soccer program with its own rules, own ball and adapted from youth soccer training in Europe is now happening at the academy. It is one more way they are promoting an inclusive culture and offering programs to help the absolute novice to experienced competitor alike. With ten board members and over 150 volunteers, and Blanchard working full-time, this non-profit is dedicated to excellence. 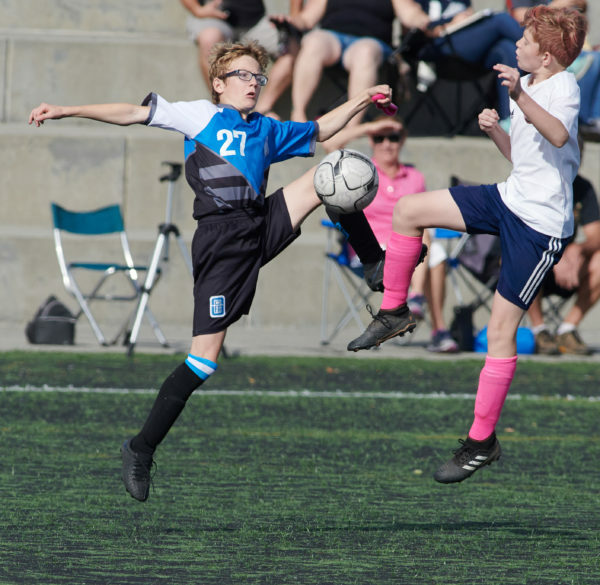 The academy has been providing programs in outdoor parks and fields around Grants Pass, but the addition of the indoor facility truly makes everyone kick up their heels. “The priority in futsal is to motivate players in an environment that is conducive to learning. The more enjoyment players experience from their participation, the more they wish to play and practice on their own. While their instinct is to play is natural, their affection and appreciation for soccer must be cultivated,” says the OFA website. The Rogue Valley Messenger had a chance to interview Executive Director, Tom Blanchard, about how he became involved with the academy and what he believes it has to offer the community. Rogue Valley Messenger: Have you always been involved with and loved soccer? Tom Blanchard: No. I was a coach, administrator and involved in athletics for Grants Pass high school, but at 70 years-old I am learning a new sport. My appreciation for soccer has increased ten-fold! RVM: Tell us how Oregon Futbol Academy started and how long it has been in existence. TB: We had an opportunity to make an already successful program even better with new perspective and vision, an indoor facility and increased financial resources. We merged with the old soccer club on June 1, 2017. RVM: What has been one of your greatest accomplishments as an organization to date? TB: Offering new programs including indoor soccer for practice and competition. We are beginning indoor leagues for adults. We are also adding needed turf soccer fields to include two full sized fields able to host tournament play, college and or professional teams. Seven smaller fields for age appropriate athletes will also be available. RVM: What activities are going on for the Fall and Winter? TB: This winter we will offer Kickers camps for ages 4-9, an indoor soccer league for ages kinder through age 14. Clinics for families with children when schools are not in session, adult leagues, a goal keeper clinic, and private lessons with our on staff professional soccer player. RVM: How does one become a volunteer for your organization? TB: Volunteers are the core of our program. We have a small staff, but many volunteers mostly serving as coaches for our athletes. Anyone can volunteer in a number of areas and all that is asked is that they pass a background check and enjoy working with kids. RVM: Anything else you would like to share about your facility or programming? TB: We welcome anyone to come down and check out our programs and tour our facilities. We are open Monday through Friday from 9-5.